Georgopoulou, S., Efraimidou, S., MacLennan, SJ., Ibrahim, F and Cox, T. (in press) Antiphospholipid (Hughes) syndrome: description of population and health-related quality of life (HRQOL) using the SF-36. 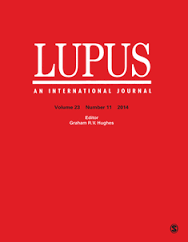 LUPUS. My particular thanks go to Sofia Georgopoulou for crafting this paper through and to all my other colleagues at Kings College and Aberdeen University who were involved. This entry was posted in Uncategorized and tagged Antiphospholipid syndrome, Hughes Syndrome, LUPUS, Quality of Life, Sara MacLennan, SF-36, Sofia Georgopoulou. Bookmark the permalink.